New 640 Signature's available - as you know, we don't make very many of these, and whenever we do, they go quickly - so, if you're interested give us a call. [added 12/21] This guitar has been sold. This one is particularly nice; very responsive, loud, and almost effortless to play. This one's got standard fan bracing, elevated fingerboard, sound ports and the composite double top: Western red cedar outside, Nomex and European spruce inside. and we may have an additional Thanksgiving discount available if you acquire this one before December 4th. More photos of this guitar in the SHOWROOM at the Hill website. Last week I did an online interview with Christopher Davis, editor of the classical guitar blog. 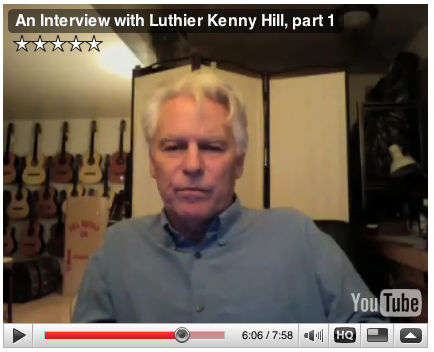 at http://www.classicalguitarblog.net/2009/11/kenny-hill-interview/. A couple of weeks before that I had happened across a very good video interview with Scott Tennant, and I was impressed with both Scott's insight, and his candor. I commented on that within the blog, and next thing I knew I was doing an interview myself. I recently got a new MacBook, which is what has enabled me to connect with all of this. I'm not too hip to computer life in general, but getting this new computer is making my excuses less sustainable. It was a painless process, (though a little painful to watch), but Christopher Davis is doing fine job and an interesting service. This interview is authentic, if nothing else. I don't know if folks will love it or hate it, but there's little room for deniability on my part. Please check it out if you have time, and look around this guitar blog. It looks like there is a lot of interesting things to be found there. Thanks again to Christopher Davis for taking the time and effort to do this. Good job!